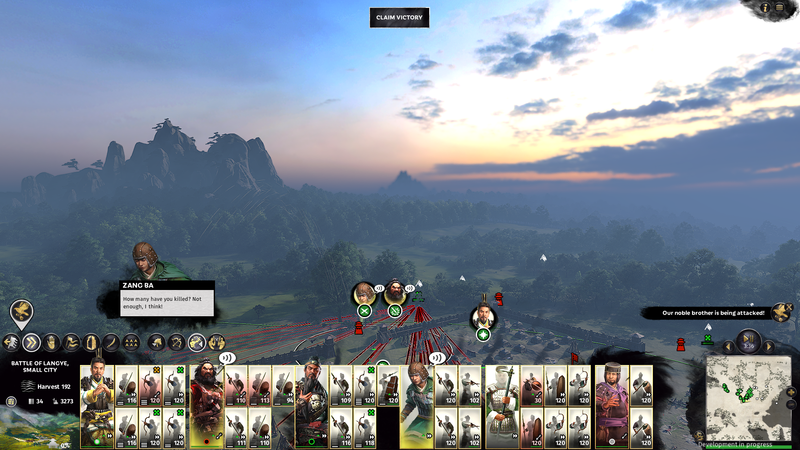 As Creative Assembly’s Total War franchise finally sets its sights on Ancient China for the first time, the series takes a leap of faith by bringing actual history and popular culture closer together than ever before. 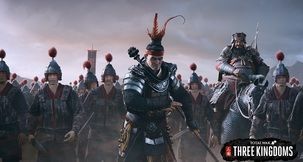 Gone are the 20-stack armies of elite troops with a general whose main purpose is to provide morale boosts – Total War has long been about units, but it’s now about characters. 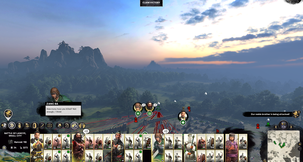 Total War: Three Kingdoms is the latest historical instalment on the long-running strategy series, arriving four years after Total War: Attila. Inspired by the eponymous period of China history that led to the unification of the country under the Jin dynasty, 3K draws inspiration from historical records and Luo Guanzhong’s mythical novel Romance of the Three Kingdoms to actualise the period and its larger than life characters. Though Three Kingdoms features two modes – Romance, where generals act like lone hero units capable of taking half an army by themselves; and Authentic, which plays like a standard Total War game where squishy general units are surrounded by bodyguards – my three-hour preview was spent with the former, digging my heels deep into the Romance mode and exploring the beautiful landscape of Ancient China as the underdog Liu Bei. 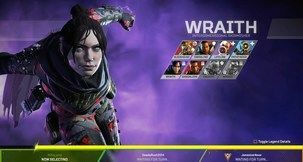 During the course of 30 turns, I’ve engaged in dozens of tactical battles and quite a number of duels – and was pleasantly surprise to find 3K Romance mode doesn’t follow Warhammer’s MOBA-like battles. Units don’t get obliterated in an instant by a hail of arrows, melee infantry doesn’t kill dozens by the second, and cavalry regains its former value as an instant morale hit when hitting enemies in the flanks. 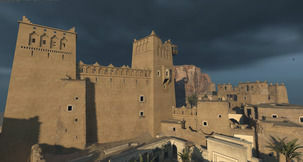 And amidst all those fields battles, the new resource camp battles, and proper city-wide siege battles (they’re back! 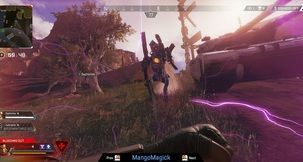 ), characters met each other in single combat, knocking the enemy off their horse before dismounting and engaging in a cinematic duel to the death. 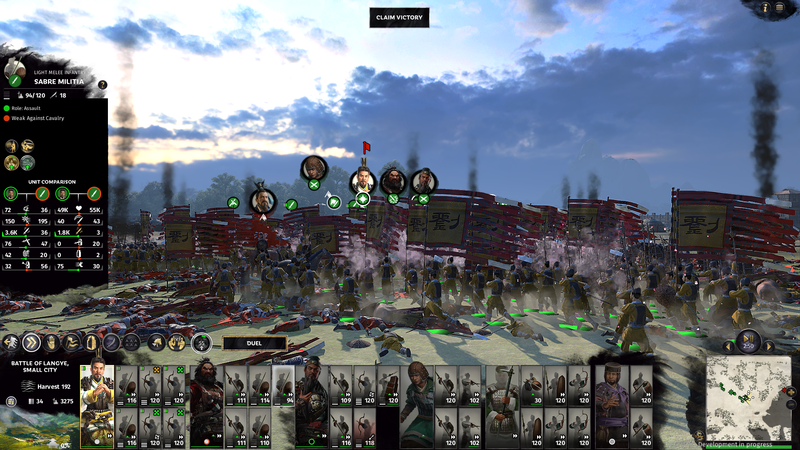 As the heroes duel, stabbing, slicing, and kungfu kicking each other until one of them either dies or flees, the army surrounds them in fierce melee, leaving a circle around the dueling opponents for as long as their faceoff lasts. That focus on heroes is a crucial part of the Romance of Three Kingdoms book and the characterisation of the period, and it contributes to what Project Art Director Pawel Wojs calls “Authentic plus plus”. 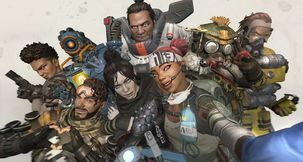 Indeed, heroes are no longer bound to specific factions, as even faction leaders can change allegiance as the campaign progresses. Factions and positions were a fickle thing in Three Kingdoms, and characters may change the recipient of their loyalty based on player actions and developments throughout the game. Characters are important as army elements, too, since units are now unlocked based on a general’s level. 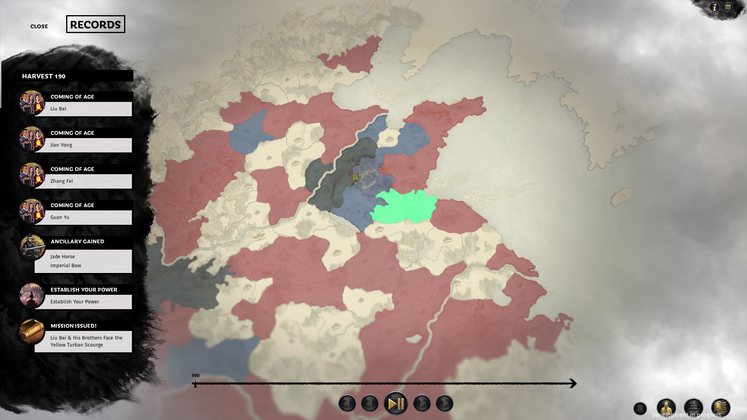 Recruits are not immediately added to the army but may take a few turns to reach full fighting strength, employing a system similar to Thrones of Britannia. 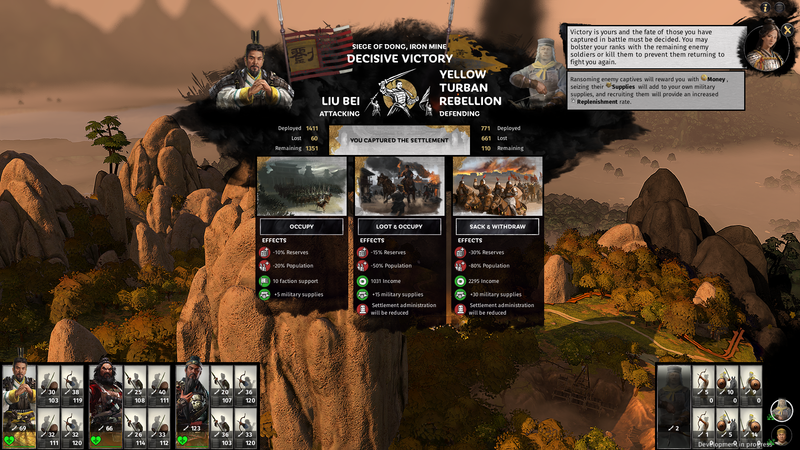 Unlike the spin-off, armies retain tactical stance options like double march, encamp, and ambush, and campaign mechanics have also been tweaked, with provinces now divided into dedicated settlements with a single building tree. Major cities offer a couple of upgrade paths for each slot, but all freedom of building is gone thanks to the lack of proper military buildings. 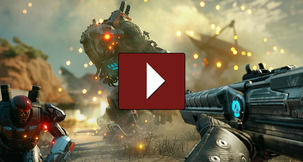 Mechanics aside, the most striking thing about the new entry is how it feels and plays. 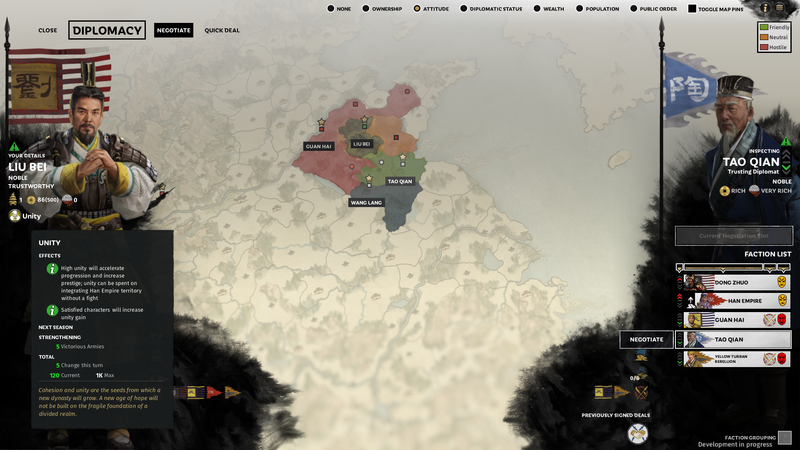 Three Kingdoms is the biggest jump in Total War development since Rome II succeeded Shogun 2: the UI, graphics, and battles all scream next-gen, replacing the established trend of menu buttons and central unit/building card elements that’s been in place since Rome II with a clean modern interface. 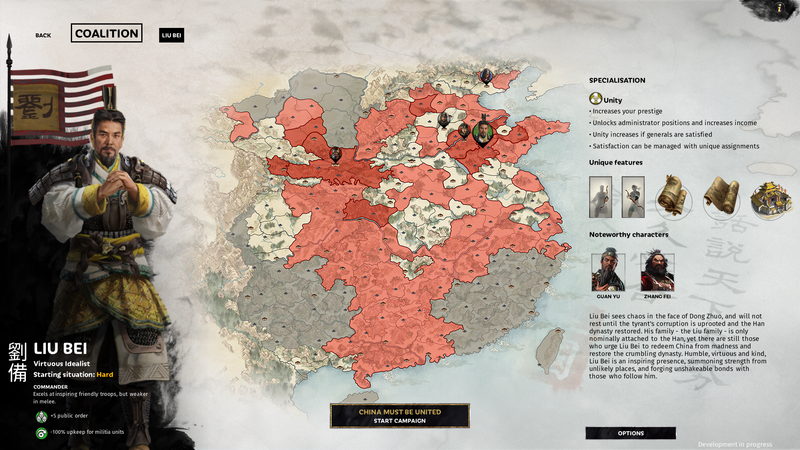 The game embraces its Chinese inspirations, using artistic representations on everything from the research and diplomacy screens to the zoomed-out overhead map. Come March 7th, Total War fans will be able to see the results by themselves. 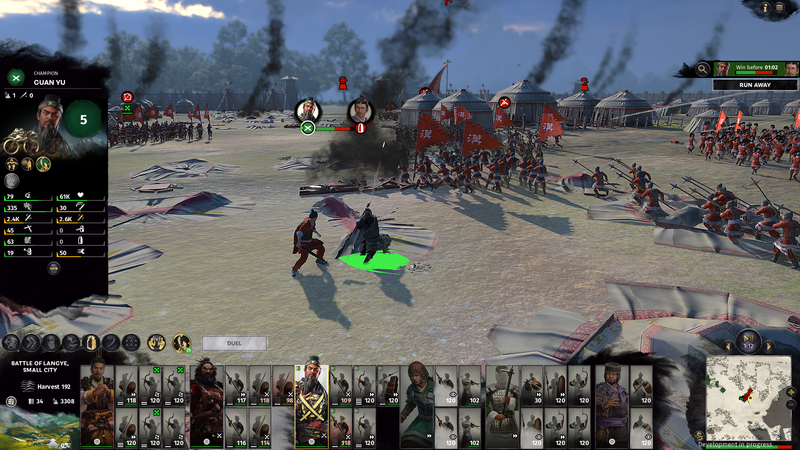 From the beautiful towering rock pillars of Eastern China to the amazing character animations during duels, Total War: Three Kingdoms feels like a next-gen game – and so far, it plays like one, too.